To demonstrate its extreme-heat protection qualities, AMSOIL 20W-50 Synthetic V-Twin Motorcycle Oil was subjected to a dynamometer test designed to simulate conditions even more extreme than the demanding stop-and-go driving conditions of a motorcycle rally or parade route. A 2012 Harley-Davidson FXDB Dyna Street Bob* motorcycle equipped with AMSOIL 20W-50 Synthetic V-Twin Motorcycle Oil was subjected to a strenuous low-speed test cycle, with significant idle time broken by short bursts of engine revving and little to no air moving across the cylinders. Like most Harley-Davidson motorcycles, the Dyna Street Bob features an air-cooled V-twin engine, which relies on cooling fins arrayed along the cylinder walls to conduct heat away. To create the most-severe operating conditions possible, the electronic temperature controls, which safeguard the motorcycle when temperatures reach dangerous levels, were deactivated. The combination of low airflow and inoperative temperature controls allowed the test lab to subject the oil and engine components to intense heat not normally experienced in the real world. Cylinder temperatures reached more than 500°F, and oil temperatures exceeded 300°F – temperatures well into the range where oils begin to break down and often lead to catastrophic failure. Most bikers want to project confidence when they ride, and nothing ruins confidence faster than killing the engine when attempting to start from a dead stop. AMSOIL Synthetic V-Twin Transmission Fluid and Synthetic V-Twin Primary Fluid help riders shift smoothly and avoid killing the engine when starting. 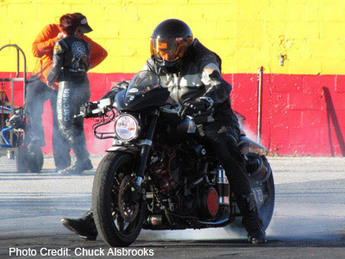 Riders can count on consistent clutch feel for confident takeoffs and more effective riding. On the highway, Synthetic V-Twin Transmission Fluid and Synthetic V-Twin Primary Fluid deliver a smooth, trouble-free ride, letting riders focus on the road instead of the performance of their bikes. 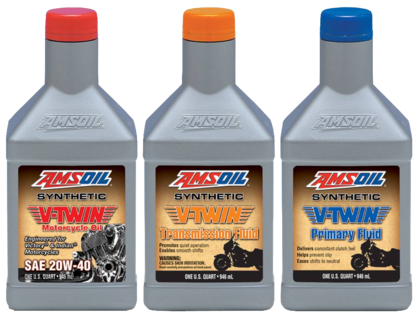 AMSOIL Synthetic V-Twin Transmission Fluid features a high-quality, durable formulation that resists shear. Its robust chemistry provides film strength to protect against damage from shock loading, while its extreme-pressure additives provide additional protection against gear wear. It is formulated to deliver quiet operation, helping eliminate loud thunks and gear noise. AMSOIL Synthetic V-Twin Primary Fluid is formulated with a balanced additive system that provides consistent clutch performance and feel. It helps riders easily find neutral while promoting smooth acceleration throughout all riding conditions. Its superior load-holding capacity helps prevent clutch slip for confident takeoffs. AMSOIL Synthetic V-Twin Primary Fluid contains a heavy dose of anti-wear additives to protect the gears, chain and compensator bearing from premature wear, while resisting thermal breakdown and remaining fluid in low temperatures to reduce drag. You’ll notice by my signature below that I am an employee of Chevron Global Lubricants. I am a training specialist and field engineer for our North American lubricants division. I originally worked for Amoco at the R&D facility before moving into marketing, and while in that role, Chevron bought our lubricants business right after I moved to Florida.